Taylor, C.j.. "Fort Langley". The Canadian Encyclopedia, 04 March 2015, Historica Canada. https://www.thecanadianencyclopedia.ca/en/article/fort-langley. Accessed 19 April 2019. Fort Langley, established 1827 on the FRASER RIVER, 32 km east of VANCOUVER near present-day LANGLEY, BC, was important in the province's development until the post's abandonment in 1886. Part of a network of trading posts established by the HUDSON'S BAY CO on the Pacific slope, it was initially a fur trade post but soon became a provisioning and administrative centre for the company's Columbia District. The old fort was abandoned in 1839 and a new one was built 3.5 km upstream. After a fire, it was rebuilt in May 1840. The fort operated a large farm, initiated fish packing and became a commercial centre for the colony of British Columbia. By the time it became a national HISTORIC SITE in 1923, its buildings were crumbling. 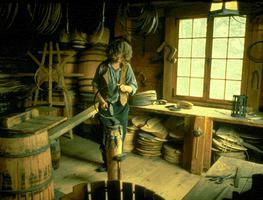 But beginning in 1955 several buildings were reconstructed, and Fort Langley is now an important tourist attraction.